Hi, all this seems like a good location to place this role which hopefully may appeal to some of the members of this club. After all I am sure that one or two of you may have used our services! :) Very happy to have a chat over this with anyone if you would like to discuss before progressing. Also Chris Holloway who I know is a member of the Club fulfils an occasional fill-in role as a DLA so you can chat to him in the Club if you prefer. 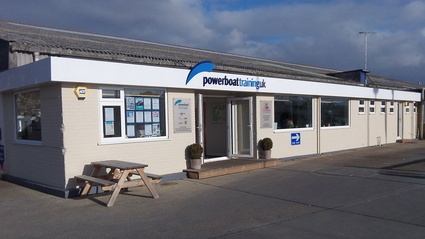 Regards, Paul Glatzel (Powerboat Training UK & Poole Lifeboat Station) Poole Lifeboat Station are now recruiting for a Deputy or 'Duty' Launch Authority Role… (This is a shore role with a pager) Do you have a passion for boating? Are you familiar with Poole Harbour and Poole Bay? Do you want to help save lives at sea and along our shoreline? Do you want to give back some time as a volunteer with your local RNLI Station? The role of the Deputy Launch Authority (‘DLA’) The DLA is a key individual within the management structure of a lifeboat station. They form part of the management group and fundamentally perform two key roles: 1. They act as the Duty Launch Authority (the terms Deputy Launch Authority and Duty Launch Authority are interchangeable terms in many stations) generally for periods of a week at a time. This means that they are the first point of contact for the Coastguard in the event of a request to launch and so make the decision as to whether to launch and what lifeboats to launch. They then brief the helm before launching and then as soon as able respond to the station to assist as relevant. Generally DLAs are on duty approximately one week in four and during the time they are on duty will need to be within pager range of the station. When the pager goes it is expected that they then respond to the Station. At busy times this could be multiple times in a week. 2. At other times they will deputise for the Lifeboat Operations Manager when he/she is unavailable at internal and external meetings, in contact with various external organisations and the RNLI centrally as relevant. They will also be allocated an area of the station’s activities to manage. This they will take an active role in managing this area and then report on progress at the Operations Team Meeting monthly. (See below) The role of a DLA is a critical one and requires a degree of commitment from those that take on the role. How much time a DLA invests as a volunteer is very much a personal decision and the more time an individual has the more they can contribute to a station and arguably the more they get back. As a rough guide though, being responsible for an area ensuring those others involved at the station are on top of the elements needed to keep the station ready to respond to the demands placed on it, is likely to take a few hours a week. On top of this the crew will have training a couple of times a week and it is helpful if a DLA from the team is around for those. Proactive visits and other meetings also warrant being at the Station or making calls. Email, WhatsApp groups and RNLI systems can generally be accessed remotely so some of this commitment may take the form of being online from home or work. More specifically what are the tasks that a DLA may take on? The RNLI operate a system to ensure that a station operates locally to both prevent the need to launch but of course is always able to respond to the launches that it is requested to make. To do this a system known as ‘L1 Assurance’ has been created. This identifies the key aspects of running a station under five subject heads, these are: • Safety attitudes (culture) • Community lifesaving plan • Lifesaving performance • Personnel • Equipment Under all of these headings are numerous subheadings. Each DLA will assume responsibility for one of these five areas and work with the helms, crew and other volunteers across the station and RNLI centrally to ensure that all of these areas are progressing as required and meet the levels required for safe and effective operation. By way of example one of the subheadings under the personnel element is ‘Trainees progression’. To stay on top of this area there is a need to ensure that the trainees understand what they need to do to progress to become a full crew member, to ensure they get the support and training to progress and are then kept informed as to how they are doing. The DLA would be expected to be aware of all of this and ensure things are progressing to plan rather than necessarily doing all of the work related to the task themselves. In short it is about management and co-ordination rather than doing everything personally. Who makes a good DLA? Given the need to make decisions as to whether to launch a lifeboat it is likely you will have some form of marine background or interest. This could be as a leisure user or a commercial boater and you are going to need to have a good understanding of the local boating area. You do not though need to have any experience of search and rescue and a full program of support, training and mentoring will be put in place to ease you into the role. DLAs and LOMs inevitably need to become immersed in the station to learn about the particular risks and issues relating to its area of operations and learn about the helms, crew and shore personnel. Having this understanding is critical so as to be able to make informed decisions when requested to launch into the more challenging situations and to ensure the other volunteers get to make the most of the time and effort they invest. As stated the DLA is a really key element of the management of a Lifeboat station so therefore of greatest importance are your interpersonal skills, approach to your role and attitude and approach. You are going to have good people skills, be reliable and be totally committed to whatever you do. Your approach must always be professional with a good attention to detail. You must have reasonable IT skills and very much a ‘can do’ approach when faced with challenges and obstacles to getting things done. You must be prepared to adopt and apply the processes and procedures in place and engage positively will all those inside and outside the RNLI that you come into contact with. All RNLI volunteer roles, including the roles of LOM and DLA, are subject to a 12 month probationary period and are subject to the RNLI’s competency based training standards. During this period, and throughout their time as a DLA, an individual is expected to demonstrate continued competence against these standards. These competencies and standards are not difficult or challenging and apply to all of the organisations volunteering roles. Your reporting line within the station is to the Lifeboat Operations Manager – known as the ‘LOM’. We are keen for people form all parts of society to consider applying for a DLA role and will work with applicants to develop knowledge and capability in areas as necessary. What do you get in return? A huge amount of satisfaction! All lifeboat stations sit at the heart of the community and volunteers, whether going afloat as helms/crew or assisting from shore, are the lifeblood of a station. An RNLI lifeboat station first and foremost exists to prevent people getting into trouble and if required to save lives – being part of a station is an honour and very rewarding. Pay and benefits Basic salary £0; overtime £0, disturbance pay for spoilt lunches £0. Equipment: A pager that may buzz any hour of the day or night and generally always at the most inopportune moment. Clothing: A jacket (you need to pay for) and a shirt (that we will pay for!!) . Satisfaction: Lots. The recruitment process The RNLI application process for this role is here – TBA In the first instance though you may wish to have an informal, confidential and no obligation chat with the Station’s LOM – Paul Glatzel. From this chat you can determine whether you would wish to apply. You can contact Paul directly via paul_glatzel@rnli.org.uk or call 07973 179869. Please allow 48 hours for Paul to see the emails and respond as the inbox is not checked daily. Can you post some vhf courses please.